Population Key: For the last eleven years we have been harping on about how important population growth is to sustained house price increases in the UK. The higher the population growth in general, the higher the house prices should rise if the supply of properties does not keep up. Housing Shortage: Let be totally frank – and suitably objective – and admit that there is absolutely no way the government and private sectors can ever hope to build enough homes for England’s expanding population – particularly in London and SE England. There is a shortage of building land, severe Nimbyism, lack of funding for builders, high taxes, planning regulations, council regulations, capital intensity, delays, risks and every other obstacle out there to prevent builders from building large amounts of properties. In general, we believe in the next ten years, London and SE England will be lucky to build 50% of the properties required. Population Boom: In London, the Office of National Statistics expects the population to soar from mid-2016 to by mid-2024 by a whopping 1,169,300, a rise of 13.7% - that’s a rise in population from 8.5 million to 9.67 million – 2% a year. Some are like Tower Hamlets is projected to rise to 355,400 - up a staggering 25.1%. Newham will see its population rise to 380,800, up 17.4% in 7 years. Number of New Homes Required: If the population rises by 1.17 million in 7 years – that’s 167,000 a year – which means London needs to build around 83,000 properties a year for the next 7 years. Currently there are only about 30,000 properties being built in London. It’s just plane mathematics. Hence it does not take a rocket scientist to predict that there will be a further drastic tightening the supply/demand equation and a rapid deterioration of the housing crisis henceforth. Housing Crisis to Worsen: We predict that after the recent gigantic increases in tax burdens for Landlords – who will no longer be looking to purchase London buy-to-let properties, particularly as the new Mayor is threatening rent caps, that a dire shortage of low-mid cost rental properties will become apparent by end 2016. This will worsen as the population boom takes hold through to 2020 and beyond. In London, more and more young people will be forced to live at home – and incoming migrant workers will be looking for rooms or flat shares in ever increasing numbers. Schools will not be able to cope with the expanding numbers and hospitals will be very stretched handling another 13% of people – many getting elderly. The good news is the economy in London will expand rapidly – and jobs will be required to build up the infra-structure to handle millions more people over the coming two decades – e.g. transport. Crossrail II Required: With such population projects – it is very important Crossrail II gets the green light urgently – since the rail capacity will need to increase to handle more commuters and people moving around for work. Tolerance: One of the main reasons why migration to the UK is so high is because – on the whole – British people are very tolerant of different cultures and types of people. This is partly because of our history with the Commonwealth. This is one reason why London has developed over many decades into a melting pot of different races and cultures and this has its attraction from migrants. Privacy: The other aspect is that generally the British value privacy and tend to keep themselves to themselves – so wealthy overseas migrants and visitors can move around London without feeling threatened by the authorities (e.g. police, government) or other citizens. May be the exception is if you are a celebrity – then you will generally be hounded – but anyone that is not well known will find London a very relaxing city to live in. Driving Property Prices: These are fairly important factors that drive wealth and less wealthy overseas migrants to settle or have second homes in London and hence this also drives up demand and property prices. With migration and London as an international attraction for overseas investors, property prices would likely be only 60% of what they are today. EU In Vote Means Higher House Prices: If the country choses to vote to remain in the EU, and with a Tory government – we see London property prices escalating far further in the next 5-10 years, as long as there is no recession. These are all have fast growing populations and significant new infra-structure projects being implemented. 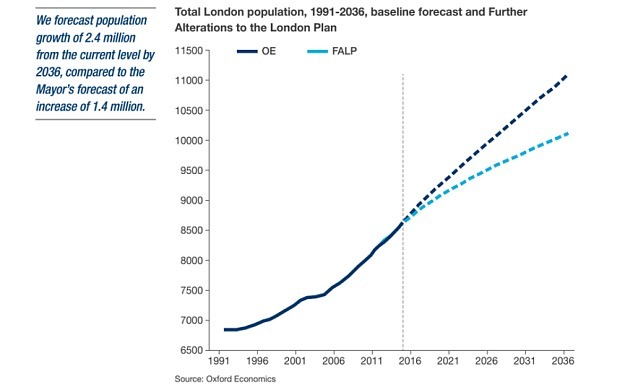 The projected overall population for London by mid-2024 is 1,169,300, a rise of 13.7%.